In 1934, when Instantwhip’s founders brought aerosol whipped cream to market for the first time, it was a revolution of sorts for soda fountains, ice cream shops and restaurants. 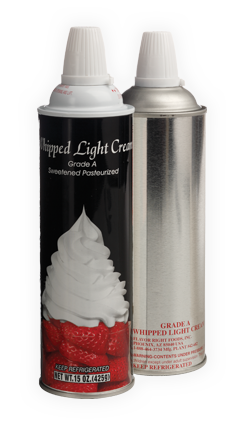 Delicious, real whipped cream could be quickly available for all kinds of desserts. Today, the list of desserts and menu items that use whipped cream has grown by leaps and bounds. But the quality INSTANTWHIP® REAL CREAM on the top has remained the same. There seems to be no end in sight as today’s creative chefs come up with more and more ways to use the taste, texture and ease of INSTANTWHIP® REAL CREAM. Ordering INSTANTWHIP® REAL CREAM from your local Route Sales Team, online or with a phone call couldn’t be easier. Since the days when soda jerks made sundaes behind the counters at the corner drug store, we’ve been making and delivering the fresh dairy goodness of real whipped cream to your door. INSTANTWHIP® REAL CREAM is fabulous on sundaes, pies, puddings, hot chocolate, gelatin, waffles, Irish Coffee and special bar drinks. High-yield dispensers specially designed for the food service industry deliver a higher yield for lower costs, while still keeping the same fresh flavor and texture of the product. INSTANTWHIP® REAL CREAM is delivered fresh so you won’t experience dispensing difficulties due to frozen or partially frozen product. Ordering INSTANTWHIP® REAL CREAM couldn’t be easier – whether it’s from your local Route Sales Team, online or with a phone call. For best results, keep refrigerated between 34-38 degrees.